Apple's logo artists have infused the iCloud logo with some mathematical elegance. In this case, the golden ratio or φ. 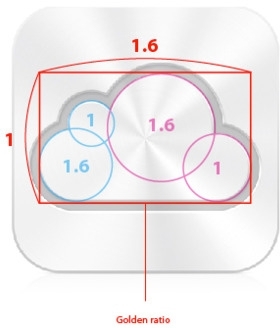 The circles in the 'puffs' of the iCloud are sized in a ratio of 1:1.6, an approximation of golden ratio, as discovered by Australian designer Alan van Roemburg. It seems unlikely the proportion was unintentional; Apple's artists simply have an acute sense of the history of design and mathematics. The golden ratio has been around since at least Euclid and Pythagoras. Fans of the Da Vinci Code should know it too, as Dan Brown has referenced φ several times in his books. No wonder iCloud seems so elegant and aesthetically pleasing. Update: The original source of the image appears to have been Takamasa Matsumoto. So, how long before Apple gets sued by these Euclid and Pythagoras guys - whoever they are - for using their proprietary ratios? ...and yes, this is a poor attempt at humor. I highly doubt this was intentional. They probably created a set of circles, copied and pasted them, rotated them, and there's your 'golden' ratio. Giving them too much credit. You would be surprised to see how widely the Golden Ratio is used. Giving them too much credit. They don't care about the minor details that much. I know the iCloud post was just for fun, so I’m not slamming it. But as a matter of interest: the Golden Ratio has NOT been intentionally used by great artists through history. You can find something “close” to that ratio in any image if you look for it. It’s like finding faces in clouds (no pun). You could pick ANY ratio, say, 11-to-17, and find something very close to it somewhere in just about any image. In modern times, the ratio is better-known and some certainly do use it. Apple may have too... but it’s a little off (thanks, stewart) and given that it was designed on a computer, I think the golden ratio in the logo is nothing intentional. This is by far the Best MacRumors article ever! Except that Alan (June 15) is not the one who discovered it (http://stam-design-stam.blogspot.com/2011/06/icloud.html) (on June 9). Alan seems to be intentionally shady too. After iCloud was announced, I found their icon to be eerily similar to the CloudApp that's been on the app store for quite awhile..the only difference is one additional circle on the left. getcloudapp.com/[/URL] hasn't anyone else noticed this? MobileMe was established before getcloudapp. It's like that MobileMe had the icon before this other company did. Now who would've thought of that? LOL. As a graphic designer I must say, this is the most ridiculous article in a while! Let me enlighten you a bit: True artists and seasoned graphic designers use the golden ratio all the time without even thinking - because you just feel that this proportion is well composed. Usually you are drawn to it almost like in auto pilot. Therefore you can take any 10 good logos or designs, or even well composed photos, and you'll probably find in 7 out of them the golden ratio implemented somehow! Apple's designers have not necessarily to be mathematical geniuses or fanboys of design history to use this proportion. Being just a experienced professional with a decent sense for aesthetics is good enough.